All prices include: accommodation, meals and guided activities; all as listed. Northern Lights, whales, and adventures on land and sea – this is a fantastic way to experience Iceland. On the water, the Ocean Diamond will provide you with a comfortable base for your voyage. Back on land, you don’t have to worry about driving, because there will be a comfy bus to transport you from one highlight to another. At the end, you can finish with a final search for the Northern Lights with a bus tour taking you to the outskirts of Reykjavik and into excellent Aurora territory. Explore the best of Iceland in autumn and search for the Northern Lights on land and at sea during this 7-night stay. On board the Ocean Diamond, you’ll journey to Snaefellsnes and Westfjords where each night you could see the Auroras at sea. Back on land, you’ll explore some of Iceland’s natural highlights and enjoy a whale and wildlife tour. Please note: the itineraries and excursions are subject to change due to weather, sea, and ice conditions and may be changed without prior notice. Combining three nights at sea and four nights on land, this holiday provides an all-round introduction to Iceland in the autumn. At this time of year, the long days of the Midnight Sun have made way for longer nights and Northern Lights, with the country painted in seasonal colours. Following an evening in Iceland’s charming capital of Reykjavik, you will travel on the Ms Ocean Diamond for the first half of the trip. This fine cruise ship will take you around Iceland’s coast from the south-west to the north, stopping at the beautiful Snaefellsnes and Westfjords peninsulas. The first is commonly referred to as ‘Iceland in miniature’, with a wonderfully varied landscape; the second is one of the most secluded parts of the country and is truly off-the-beaten-track. In both locations, you will have the chance to add daytime excursions to your itinerary, including trips to the Snaefellsjökull Glacier and Dynjandi waterfall, kayaking, and a ‘Viking Sushi Tour’. Please see the ‘Personalise’ section for more information. Given your location offshore, you should be well placed to see Aurora displays during your nights at sea. Voyaging the Icelandic waters, you are also likely to spot different types of whales. Onboard the Ocean Diamond, we have included a series of fascinating presentations on both the Northern Lights and whales in this region, as well as subjects of local history and culture. In addition, the ship offers a full entertainment programme in its theatre-style auditorium. Back onshore, you will spend three nights exploring Iceland’s highlights, staying at an assortment of welcoming hotels. You will begin at the pristine Lake Myvatn before exploring the stunning lava formations of Dimmuborgir. Iceland has a number of picture-perfect waterfalls and our holiday includes a visit to Dettifoss, which is Europe’s most powerful waterfall, and Goðafoss, which is believed to contain the statues of Norse Gods. Search for Iceland’s marine life with a guided RIB wildlife and whale safari and enjoy a guided tour of the colourful city of Reykjavik. A Northern Lights hunt will bring a memorable end to this holiday, particularly if you are lucky enough to witness an Autumn Aurora display as these can be utterly breathtaking. 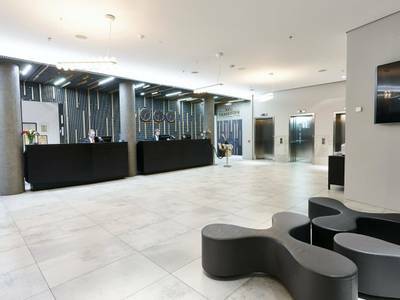 Following your arrival at Keflavik Airport, you will be transferred to your hotel in Reykjavik. Depending on your arrival time, you will have the remainder of the day to explore the world’s northernmost capital. Reykjavik is a charming city characterised by its colourful buildings and dominated by Hallgrímskirkja which is a modern cathedral 74.5 metres high. It is an architectural masterpiece and well worth a visit. The city itself is famous for its incredibly fresh seafood and there are some fine restaurants and cafés, particularly down by the old harbour. Reykjavik is small in comparison to most European cities and the best way to experience the city is by simply walking the streets and admiring the colour and stunning landscapes which surround it. For dinner, we would highly recommend trying out one of the many seafood restaurants. For recommendations, please speak to one of our Travel Experts. During the day you can spend your leisure time exploring the charming delights of Iceland’s colourful capital Reykjavik. You will be transferred from the hotel to the harbour, which is just a five-minute walk from the city’s lively downtown area. From here you can enjoy its assortment of shops and eateries. Be sure to return to the harbour in time for boarding the Ocean Diamond, which starts at 18:00; the ship will leave the docks at 20:00. During your three nights on the Ocean Diamond, you can enjoy a selection of specialist presentations covering topics such as the Northern Lights, local history and culture. After dinner in the restaurant area, you can head outside and look to the skies for the Northern Lights. In the morning, the Ocean Diamond will reach the village of Stykkishólmur, based in the scenic Snaefellsnes Peninsula. This region is often referred to as ‘Iceland in miniature’, as it showcases many of the island’s varied landscapes in a small area. After breakfast, there are some excellent optional excursions which you can add to your itinerary for an additional cost. Try a ‘Viking Sushi Adventure’ and combine bird watching on the water with seafood tasting. You may also like to enjoy a bus tour of the Snaefellsnes Peninsula, taking in its amazing landscapes. Please see the ‘Personalise’ section for more information. Lunch and dinner are included today. 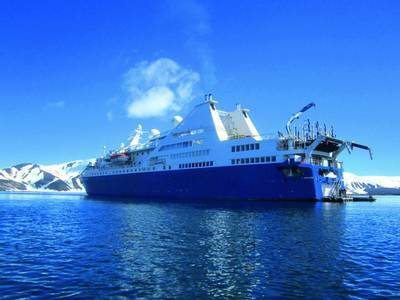 At 18:00, the Ocean Diamond will leave Stykkishólmur for the Westfjords Peninsula. As you sail along, be sure to search for the Northern Lights in the sky before turning in for the night. The quiet town of Ísafjördur is the capital of the Westfjords Peninsula – a region that is notably untouched, even by Icelandic standards. There are some very impressive fjords in this area providing many photo opportunities. Following breakfast, there are more excursions which you can add to your itinerary. Try your hand at catching different types of fish on a sea angling tour, see the magnificent Dynjandi waterfall or kayak the waters around Flateyri. Please see the ‘Personalise’ section for more information. Lunch and dinner are included today. In the late afternoon or early evening, you can attend an onboard presentation about the Northern Lights before keeping watch on the skies later on this evening. In the early morning, you will arrive into Skjálfandi Bay in Northern Iceland. One of the highlights in this area is the volcanic Lake Mývatn which was formed during an eruption over 2300 years ago. Following disembarkation, you will explore the natural beauty of the area, including the extreme lava formations of Dimmuborgir. Dimmuborgir is known as the ‘dark castles’ and you will understand why as you walk up the footpath towards the lava fields. The formations are shaped like a crumbling, ancient citadel and you will undoubtedly feel like you have stumbled into a fantasy film set. Your tour of Lake Mývatn will also include a visit to the pseudo craters of Skutustadir, which were formed by gas explosions when boiling lava flowed over the wetlands. These magnificent craters further highlight the extreme diversity of Iceland’s landscape, which is unrivalled anywhere else in the world. Following lunch, you will return to the coach and head to the northern part of Vatnajokull National Park. Here you will find the magnificent Dettifoss Waterfall, which is the most powerful in Europe and is a splendid example of mother nature. The sound of the cascading water is incredible and we would highly recommend making sure your camera is fully charged as you will no doubt want to take photographs. You will overnight in Husavik, which is a charming little fishing town on the shores of Skjálfandi Bay. Dinner will be enjoyed at your hotel. After enjoying breakfast at the hotel, you will enjoy a whale and wildlife safari on a RIB (rigid-inflatable boat). Husavik is the whale watching capital of Iceland and the town’s offshore waters are home to 15 different species of whale, including Orca and Humpback. In addition to these graceful animals, you may also potentially spot seals, dolphins and various seabirds. It is the perfect way in which to experience Arctic wildlife whilst also admiring the stunning surroundings of Skjálfandi Bay. The tour will take approximately three hours. 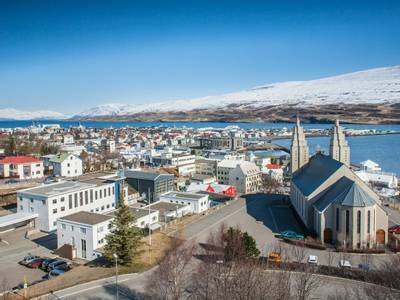 Following the tour, you will return to the coach and head towards Akureyri, which is Iceland’s second largest city, but with a population of only 18,000 residents, it feels more like a bustling fishing town. The drive to Akureyri will include a stop at Goðafoss Waterfall, which translates to ‘waterfall of the gods’. According to legend, law speaker Þorgeir Ljósvetningagoði declared Christianity the official religion of Iceland and threw his statues of the Norse gods into the waterfall. You can understand why the area is a place of myth and legend as the waterfall itself is majestic, cascading from a vivid green valley. Lunch will be provided during the journey and you will overnight in North West Iceland in either Laugarbakki or Gauksmyri. Dinner will be enjoyed at the hotel. Following breakfast, you will return to the coach and head back towards Reykjavik, enjoying numerous stops along the way. Firstly, you will visit Deildartunguhver which is Europe’s most powerful hot spring. Most of the water used for central heating in the towns of Borganes and Akranes is taken from Deildartunguhver. In fact, if you happen to take a shower within 65km of the hot spring then you have bathed in its waters! The billowing clouds of steam created by the spring are an impressive sight to behold. After visiting the hot spring, you will then return to the bus and make your way to Thingvellir National Park, which is one of the major highlights in Iceland and is alleged to have been the location of the worlds first parliament. You will stop at Hraunfossar waterfalls en-route, before arriving into Thingvellir. Lunch will be provided along the way. Following your exploration of Thingvellir National Park’s historical sites, you will return to Reykjavik and enjoy a guided tour of the city. You will then have a final opportunity to seek out the Northern Lights with a bus tour to the outskirts of Reykjavik where there is minimal light pollution. Hopefully, your final evening in Iceland will be spent admiring Nature’s greatest light show. After breakfast, you will be transferred to Keflavik Airport for your flights home. 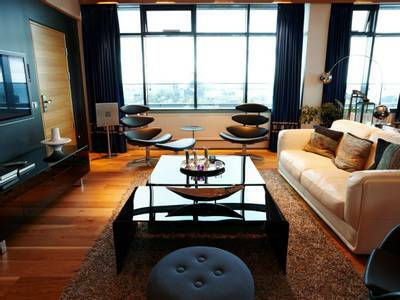 If you wish to extend your stay in Reykjavik, then please speak to one of our Travel Experts. 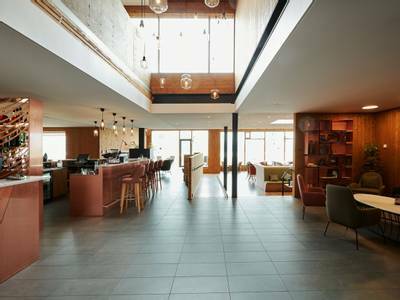 Fosshotel Mývatn opened in July 2017 and offers 92 rooms in a stunning natural setting north of Lake Mývatn. 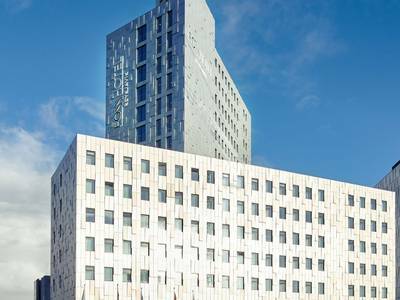 The hotel is designed by award-winning architects and features almost exclusively low-environmental impact materials. 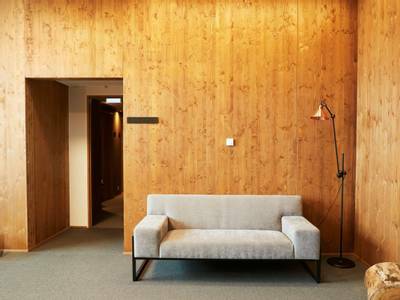 The building is low-rise and clad with larch wood. There is a grass roof which blends perfectly with the surrounding nature. 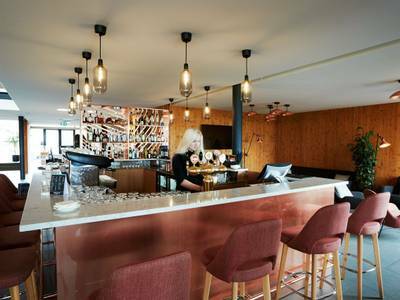 A wonderful restaurant is located on the ground floor with a fantastic view over the lake.The wilderness location ensures that there is very little light pollution and it is not uncommon to spot the Northern Lights from outside the hotel. Enjoy the spectacular lake views from the ground floor hotel restaurant. 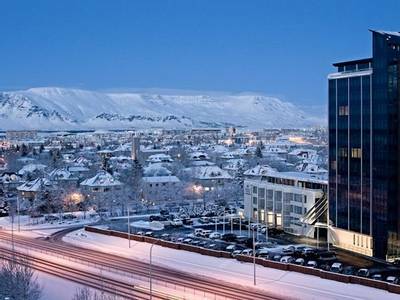 The hotel enjoys a stunning location amidst the tranquil Icelandic countryside ensuring very little light pollution. 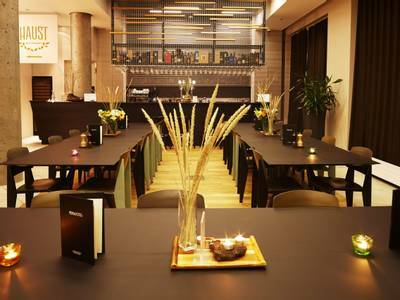 Venture out onto the outdoor terrace and potentially spot the Northern Lights. Standard double or twin: These bright and spacious rooms are equipped with a TV, ensuite bathroom, tea and coffee making facilities, a hairdryer and complimentary toiletries. Free Wi-fi is available in all rooms and the large windows offer fantastic views of the surrounding countryside. Lake view room: The hotel is relatively new and this is reflected in the modern and spacious style of the rooms. 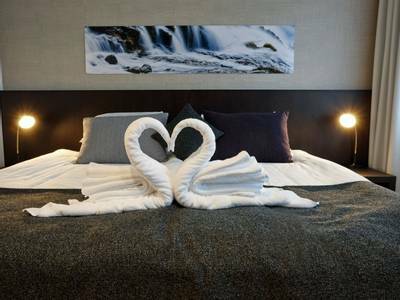 The lake view rooms have double or twin beds and large windows looking out onto Lake Mývatn. 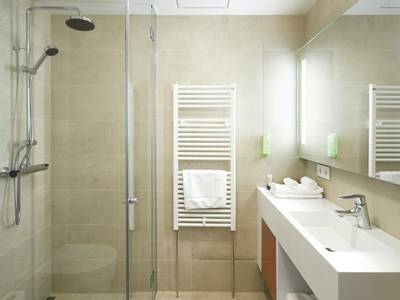 Each room is equipped with a TV, ensuite bathroom, tea and coffee making facilities, a hairdryer, complimentary toiletries and free Wi-fi. Sveinbjarnargerði is a family owned hotel which is a 10-minute drive from Akureyri. The setting is fabulous, with stunning views of the Eyjafordur area, its mountains and the fjord itself. An outdoor terrace is the perfect spot to admire the countryside and during the dark autumn nights, you may even spot the Northern Lights. 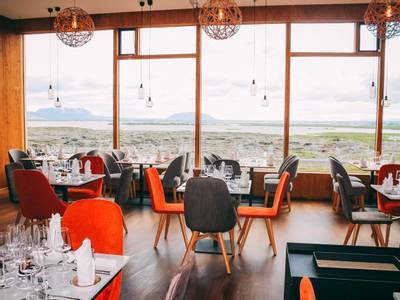 The hotel contains a stylish in-house restaurant which has a cosy fireplace and a particular focus on traditional Icelandic cuisine. There is also a relaxation area which features a hot tub, ideal for those winter evenings. 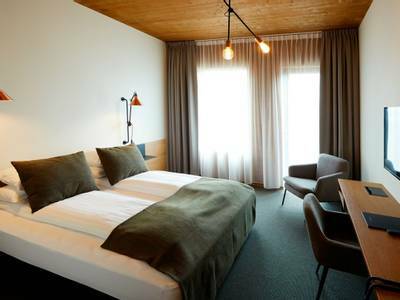 Double or twin room: the rooms at Sveinbjarnargerði are bright and cosy and the location ensures a fantastic outlook. 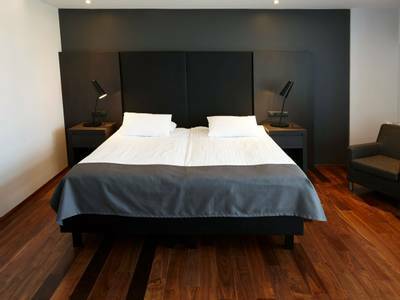 Each room is equipped with a double, or two single beds, a flat-screen TV, a work desk, private bathroom, hairdryer and a seating area. Explore the secluded regions of Westfjords on this bus tour, which takes you to the little-populated town of Þingeyri, which holds the honour of being the region’s first trading post. Following this, you will be taken to the impressive Dynjandi Waterfall, which is the highest waterfall in the region. It is appropriately named, as ‘Dynjandi’ is said to translate as ‘thunderous’. Packed lunches are included. Please note: clients pay for this excursion on board in USD. You will be taken around the many islands of Breiðafjörður, looking out for and learning about the different types of birds which can be found here. You can also admire the incredible rock formations that are dotted around these waters. That covers the ‘Viking’ part of this adventure – as for the ‘Sushi’, that comes in the form of delicious scallops, straight from the sea! The Snaefellsnes Peninsula is often regarded as being ‘Iceland in miniature’, as it seems to showcase many of the country’s different environments in one location. You will be taken by bus to the Snaefellsjökull Glacier, the coastal formations of Snaefellsnes, and the basalt pinnacles of Lóndrangar. There will also be a stop in the village of Arnarstapi and a visit to the Shark Museum of Bjarnarhöfn, with entrance included. Packed lunch is also included in the price of this activity. The rich waters of the Westfjords region are full of marine fauna, and this trip gives you the chance to try your hand at catching the likes of cod, haddock, and halibut. The outing will either start from Flateyri or Suðureyri, both of which are fishing villages. This is quite an active excursion, and we recommend wearing plenty of warm layers and bringing a bottle of water along with you. Kayak around the coast of Flateyri, a quiet fishing village in the Westfjords region. You can take in the lovely mountain scenery and look out for local birds in the sky. 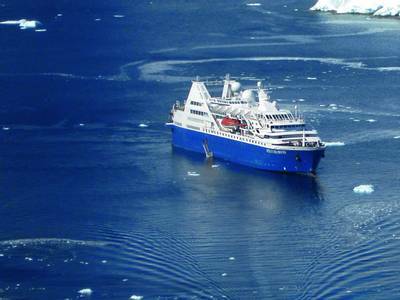 Price based on: 3 nights on the MS Ocean Diamond (Cabin Type P – 'outside cabin with porthole' - upgrades available), 1 night in a hotel in Husavik, 1 night in a hotel in Western Iceland and 2 nights in a Reykjavik hotel. Please note that the following payment and cancellation terms supersede those mentioned in sections 2 and 6 of our general booking terms and conditions.